The prime minister’s office denied suggestions that Malcolm Turnbull had given support to Bill Shorten’s proposal for four-year terms. Opposition Leader Bill Shorten has called for a pre-election agreement between government and opposition that whichever side wins will hold a referendum for fixed four-year terms. Soon after Shorten, interviewed on the ABC’s Insiders, put up his proposal on Sunday morning, Malcolm Turnbull rang him on various matters. 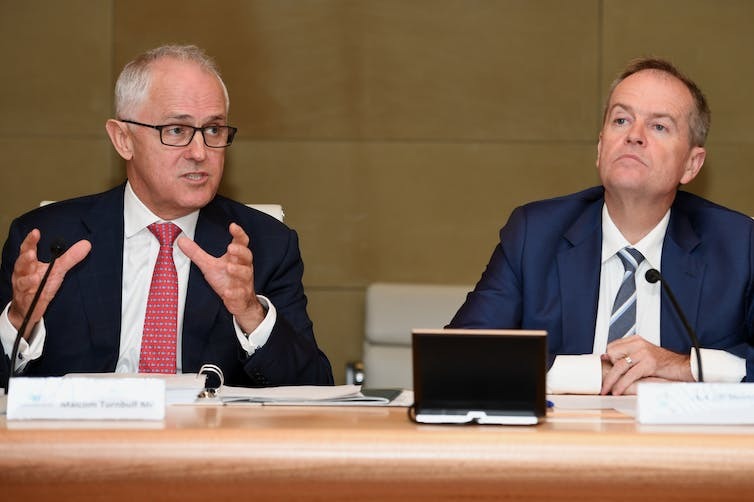 The prime minister’s office said that Turnbull had said he was interested in talking with Shorten about four-year terms, while noting there were a lot of complications. But it denied suggestions Turnbull had given to bipartisan support to Shorten’s proposal. Labor insists it did not suggest that Turnbull had given bipartisan support. To pass, a referendum would have to get majority support, plus a majority in four of six states. History shows the difficulty of passing referendums; the prospects are considered hopeless without bipartisan support. Currently there is bipartisan backing for a referendum on Indigenous recognition but this has been delayed and derailed. The present federal term is three years, with the prime minister having discretion on when to call the election. Shorten said the federal political system seemed “out of whack in that everything is so short term”, with the average term being two-and-a-half years rather than three. He would be prepared to come to an agreement with Turnbull that whoever won the election, the government and opposition would put an agreed change to the Constitution for four-year terms to the people. On the tricky question of the Senate terms, which are six years at present, he said that could be worked out if there was agreement on four-year terms. “It shouldn’t be a deal-killer in my opinion,” he said. While four-year terms have substantial backing in the business community and elsewhere and operate at state level – Queensland last year passed a referendum for a four-year term – dealing with Senate terms is a central problem in winning support. Eight-year Senate terms would not be publicly acceptable, and a move to four-year Senate terms, with all senators facing the people at each election, would be unlikely to be embraced by the Coalition. In 2002, Turnbull backed longer terms while saying the real issue was getting bipartisan support. When opposition leader in 2008, he said the then NSW Labor premier, Nathan Rees, was “exhibit A in the case against fixed four-year terms”. The link below is to an article reporting on persecution news from Iran, where 8 Christians have been sentenced to lengthy prison terms. Plinky Prompt: What Can&apos;t You Throw Away? value, but still are important to me for one reason or another. The sentimental items though are not always items I have a lot of use for in practical terms – generally they mean a lot to me because of the people from whom they have come. One such item that is very important to me is a ‘chip’ I received during a visit to a casino of all places, in Sydney, when I went there with Rebecca several years ago. Rebecca died almost three years ago, so this chip has special meaning to me as a reminder of both Rebecca and the trip to Sydney that we enjoyed together. I have made it into a keyring and it is always with me.